Image acquired, with thanks, from the Library of Congress Prints and Photographs Division, Reproduction No. : LC-USZ62-93896. Text by Jacqueline Banerjee. 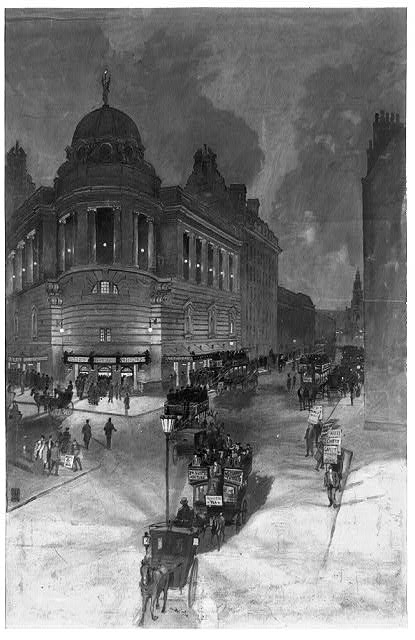 The New Gaiety Theatre was built to replace the original Gaiety Theatre managed by George Edwardes, which had fallen prey to the London County Council's "Strand Improvement Scheme." The architect chosen for the task was Ernest Runtz (1859-1913), not as famous a theatre architect as Frank Matcham, but still one with a very large practice, who designed commercial buildings as well (see "Ernest Runtz & Ford"). But the London County Council found his designs wanting, and called in Richard Norman Shaw to improve on them. Runtz was responsible for the dome on the corner, but it was Shaw who suggested the "flanking high loggia of paired columns and also improved the design of the higher Gaiety Restaurant behind, which faced the Strand." After a chequered history the "powerful exterior of the Gaiety, which Pevsner thought 'Norman Shaw's best design after he had gone classical or Baroque,' was demolished in 1957" (Stamp 65-66). Both the type of building and its style may come as a surprise to those who know Norman Shaw chiefly for his earlier, picturesque domestic architecture. Enest Runtz & Ford. DSA Architect Biography Report. Dictionary of Scottish Architects. Web. 23 Feb. 2011..